At last, a lizard that is neither from the past nor a myth, but a creature that lives and breathes to this day. Meet the Komodo Dragon, the largest and most poisonous lizard on earth. Found only in the remote islands of the Philippines, the venom of this reptile is so deadly that it effects every part of its victim's body - and the Komodo is well known for its rapacious eating habits. It does not leave even a single scrap of its victim undevored. Even more interesting is how this poison is generated. The Komodo keeps chunks of meat in its mouth and lets them rot for weeks, and the saliva turns into that lethal dose. That's about enough information to have you going into the theater, expecting a creep or two to go down your spine. But you find the feeling a little too staid and caricaturish. There is an attempt to recreate the haunting feel of Anaconda, but it ends up leaving things a little too late. One quiet night at Emerald Isle (North Carolina), a shipment of animals is being transferred to a zoo when, upon getting a foul smell, the driver chucks out a carton of rotten eggs in the woods. In a flash, twenty seasons have gone by and 15-year-old Billy Connally wanders off into the woods on his way from school. His curiosity gets the better of him when he tries to trap a tiny lizard and something mysterious grabs him, Billy manages to escape, but whatever it is that scared him follows him home and kills his entire family. Billy is shocked out of his wits. Then, one fine day, a psychiatrist, Victoria (Jill Hennessy), comes along to help cure Billy. As part of his treatment, she takes Billy back to his home in the woods of Emerald Isle, and here we come face to face with the Komodo Dragon. Mind you, not one or two, but a whole group of them. With a little help from a biologist (Kevin Zegers), the mystery of the presence of these lizards is unraveled. 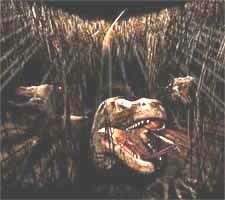 Billy decides to take matters into his own hands, and takes his revenge by killing the Komodos one by one. But when things get a bit too much too handle, the trio manages to escape to safety. The sole problem with this movie is that it has a very childish feel to it, and the Komodos are not all that scary. The suspense is neither thrilling nor captivating. The animation by John Cox (Creative Workshop), the animators for Jurassic Park, is competent, but seems to have been exhausted the bag of tricks. There's nothing mind-blowing about their work. If you miss this one, you aren't missing much. Be the first to comment on Komodo! Just use the simple form below. fullhyd.com has 700,000+ monthly visits. Tell Hyderabad what you feel about Komodo!